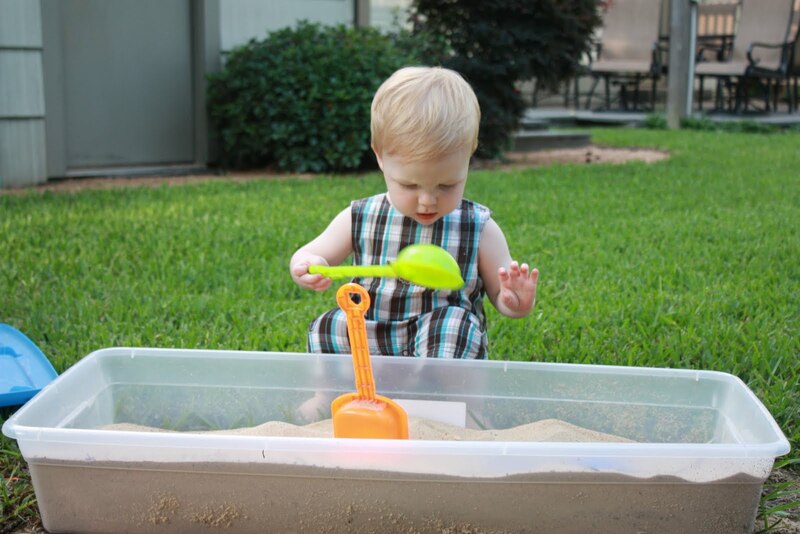 One of the bloggers that I follow (Prudent Baby) said she used a Christmas wreath box for a small sandbox for her daughter. That got me thinking about an unused under the bed storage container that I had lying around. I had it lying around, because Alex bought it and we have zero under the bed storage available. 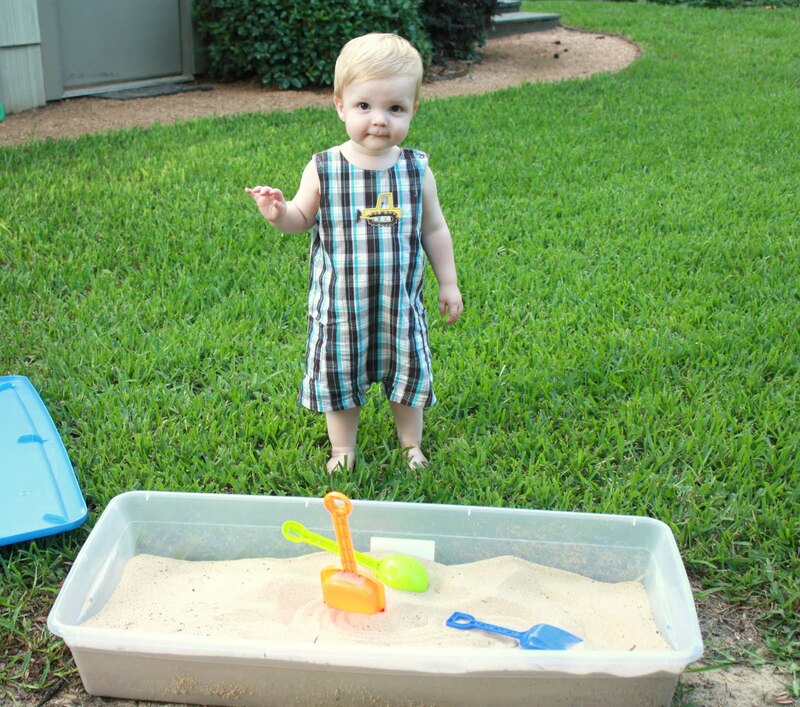 Would Zach like to have a sandbox? Could I use this as an excuse to paint on the lid and/or stencil? No and no are the short answers to those questions. 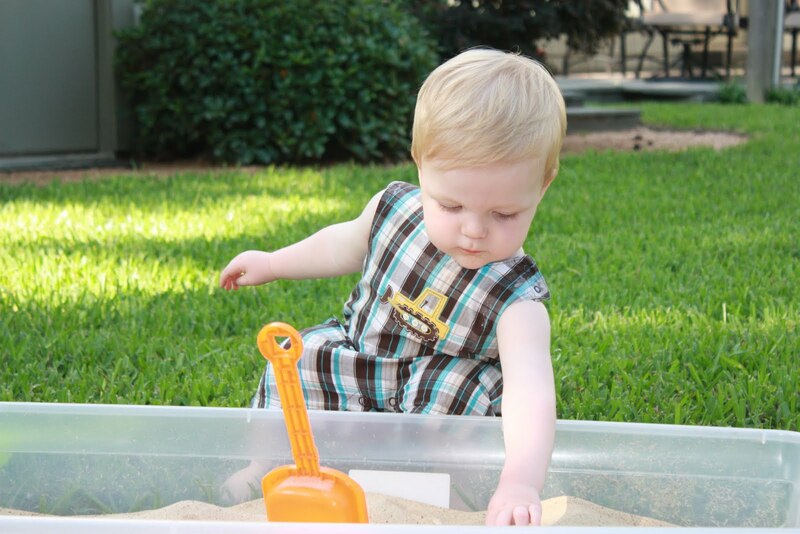 Why would he not like a sandbox? A toy that is a staple in many a house and park? Turns out Zach is a very textural guy. He does not like to get his hands grimy, touch slimy or gritty food (much less eat it) and he prefers his feet to be clean. As you can imagine, none of these bode well with a sandbox. But, as usual, I didn’t let my son’s personality deter me as I bought and drug into the backyard 100 lbs of sand and some sand toys. Zach really only likes to play with the toys, carrying them around the yard and into his water table, avoiding the sand all together. Once the newness wore off (for me) it has been relegated to the non-grass growing part of our yard and is mainly used for Norman to hurdle over. And it is just, as one of my friends said “a box with sand”. Oh well, it is good for his friends at playgroup when they stop by.